Meet The Name Behind Kouzounas Kitchen. My love for food started at a very young age. Both my parents are wonderful cooks, and we have many cooks on my dad’s side of the family in Greece. Growing up in a crazy Greek family, who appreciates food was a good start towards my love for cooking. At the age of seven I was officially making my own Greek recipes including spanakopita, keftedes, baklava, and much more. In 2008 I acknowledged the passion I had for the culinary arts and enrolled into the pastry chef program at Le Cordon Bleu in Sacramento, California, and in 2009 graduated with my pastry degree. I fulfilled a long awaited dream of mine recently. Back To My Roots cookbook was published on February 28, 2016. Back To My Roots is not only packed full with mouth-watering recipes, but I also share my personal story, kitchen tips and tricks, bits and pieces of the history of olive oil and its benefits, and much, much more! Currently I am working on my second book, which will focus on the benefits of olive oil, many unique recipes ranging from vegetarian, to vegan, and so much more! Stay tuned in for more details. * Featured above is my family. 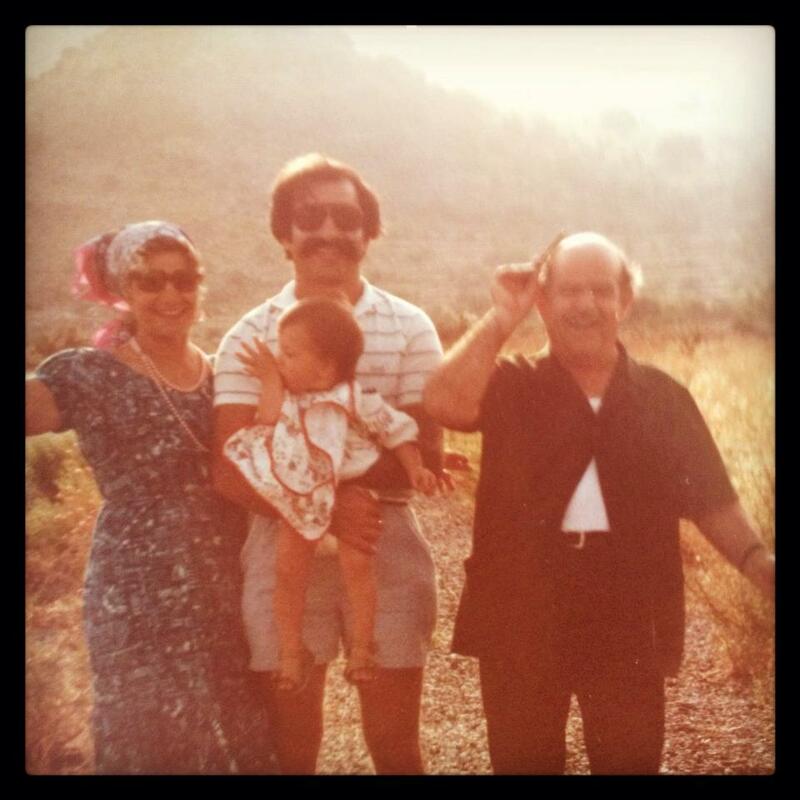 To the very left is my yiayia who I dedicate this blog to. Thank you to my wonderful family for inspiring me to make Kouzounas Kitchen happen. Hello krystinakala You have a great blog here Keep writing and enjoy. Ok fine..all the best for your future writing..Please go though my personal blog you can find more.Have any help in WordPress support.Feel free to contact. Yes as a chef from around the world my main goal is to have my own Little Taverna, as us Greeks would call it. 🙂 I am soon to be having my own cooking classes & catering in the Sacramento area. I loved your blog! Thx for the lovely comment. Hello from Sacramento!!! It was a pleasure meeting you today at the Land Park Farmer’s Market, a great way to spend Sunday morning. Your pastries, your story and website are all spectacular. Looking forward to seeing you again and sharing our love of all things ellinika! Nice reason for starting a blog. I hope to learn more from you. Look forward to your posts. Enjoy the rest of your weekend. This blog is great! Very fun to see all this great food and to learn where your love of making it comes from. Thanks for following my blog. I look forward to following yours! PS I’m not sure if you know; I’m also on Twitter (https://www.twitter.com/btalks) and have a Facebook Page (https://www.facebook.com/PostsOfHypnoticSuggestion). If you fancy joining me there, you’d be very welcome. Don’t you just love the people you meet and things you discover. I used to see social media as a teenage distraction. Now it’s a middle age source of information and sharing….! I really hope you manage to fulfil your restaurant dream – I would be sure to visit! 🙂 My in-laws have a Greek restaurant here in London – you must come one day! Thank you Ekaterina! I sure Hope I do too. I couldn’t be happier to have found your blog today! 🙂 Instead of going through and liking ever single post here is one huge “LIKE”. I am going to go look through your recipes now. Thank you for following y blog, I’ve come to return the favor and look forward to exploring your blog. Congratulations Krystina! Three stars ☆ ☆ ☆ for Blog of The Year 2013 Award! Wow, thank you very much!! I will post about this award, hopefully in the next few days. Thank you again, Happy New Year! Hi Krstina! Thank you for liking Foodbod’s write up about me at my blog the glen house today. Come back and visit me any time! What a wonderful blog with great food and ideas, I wish i had more time to explore more today but I will certainly be back, thank you for sharing ! Great blog!! 😀 I love everything Greek….After all, the hubby is Greek and love Greek food, not to mention beautiful Greece and its people. What a lovely blog! I recently came back to Athens and have started collating family recipes. Really looking forward to seeing more of your posts! Hi Krystina! Your blog looks wonderful… your yiayia did a great job teaching you and giving her know how further! You’re very welcome. I sure hope you do too. 🙂 Have a beautiful weekend. Truly amazing! Love the story and the amazing authentic food! Wonderful! My father is from Mani, Greece. Maniates and Cretans are alike. You’re a sweetheart!! Thank you Sooo much. 🙂 Me too!! Hello, I found your blog via a “like” you posted on one of my recent posts. I am so new to this so you can imagine what great encouragement this gives me. Thank you. I love Greek food and will most definitely enjoy following your blog! Hello, I looked through your recipes. I found quite a few that I’d like to try. We are lovers of Greek food here! I would like to personally congratulate you as your blog Kouzounas Kitchen has been selected by our panelist as one of the Top 40 Greek Food Blogs on the web. Thank you very much for the top 40 Greek blog post. 🙂 Wow, what a great site you have. I am happy to share this post. Thank you so much to my dear friend for sharing this beautiful post. Our time in Kritsa will be a loving memory to remember forever. 🙂 I can’t wait to see you both again real soon. Polla filakia stous duo! family doesn’t eat them all first. My son loves them. Thank you so much Krystina for the delicious Baklava. Thank you so much agapi mou for your kind words. 🙂 I can’t wait to see you again soon. Kala Xristougenna kai kalh xronia!! Such a pleasure meeting you today! Thank you for everything… What an experience! Very nice to meet you too! I am packing up your spices today. 🙂 Thank you for coming by and I hope to meet you guys soon in Reno. 🙂 Hi to you all.